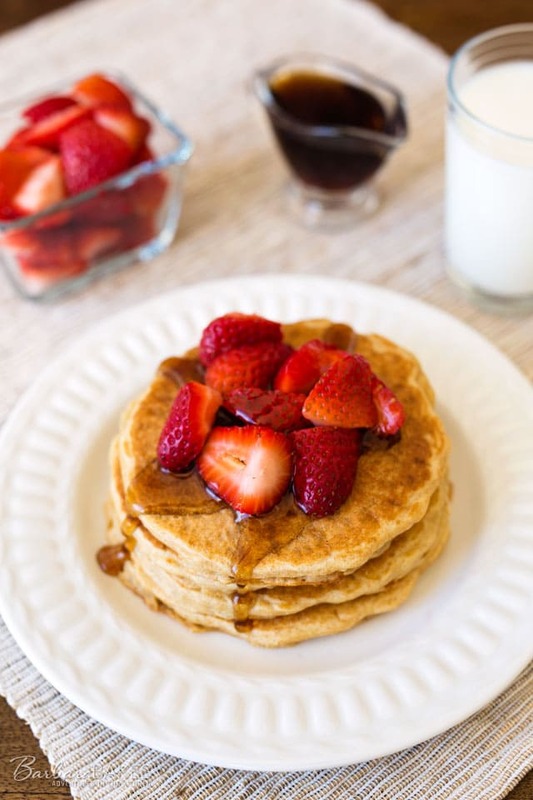 These Whole Wheat Sourdough Blender Pancakes are light and fluffy sourdough pancakes made with whole wheat pastry flour. Ruthie, from Cooking with Ruthie, recently shared her sourdough starter with me and I’ve been having fun trying out different sourdough pancake recipes the last few Sundays. If you don’t have a sourdough starter, it’s really easy to make and get started. Annalise, Completely Delicious, posted a sourdough pancake recipe that was adapted from a Red Star Yeast recipe. Did you know sourdough starter is created from naturally occurring yeast? King Arthur Flour has an interesting article about sourdough. One thing I like about the recipe on Completely Delicious is it doesn’t require you to make the batter the night before. You just let the sourdough part of the batter rest for 30 minutes before adding the other ingredients. 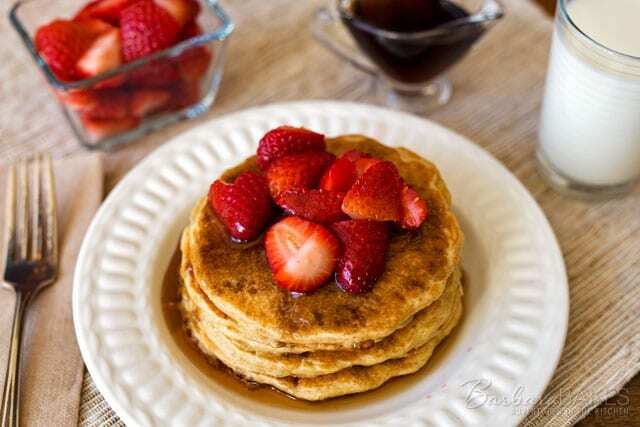 For this recipe, I combined the recipe on Completely Delicious with my Whole Wheat Blender Pancake recipe. Making pancakes in the blender is so easy, and you only dirty one dish. Adding the sourdough to the pancake batter gives it that special sourdough tang that my family loved. I’m sure yours will too. Add milk, sourdough starter and flour to blender jar in the order listed and pulse several times just until blended but not smooth. Add eggs, sugar, baking soda and salt and pulse just until blended. It's okay if a few lumps remain. Heat griddle to 325°F. Grease griddle. Pour batter onto griddle when hot (about 1/4 cup at a time - the batter will be thick but spreads a little as it heats) and cook until bubbles form and edges dry. Turn and cook other side. Serve pancakes with butter, maple syrup, and fresh fruit or as desired. Very nice. We made banana pancakes and topped them with peanut butter. I’d much rather have these. I’m always looking for ways to use my sour dough starter. I haven’t tried pancakes, yet. I have a KAF sour dough starter (and love it). One more recipe for me to pin and try. My dad made sourdough pancakes and I loved them. This looks like something to tackle this weekend! Let me know if you need some starter? This look so good! I am on a sour dough kick right now! I will have to try these next! I am so happy I found your lovely blog! Barbara these pancakes look amazing! We have to try this recipe- thanks for sharing! I would love this pancake for breakfast! It’s beautiful! They look irresistible! I bet they taste amazing too.